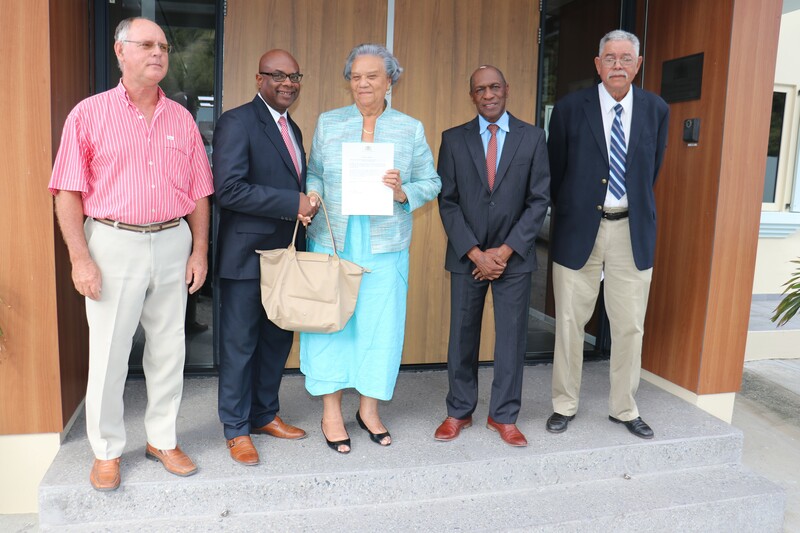 Photo Caption: Marie De Weever was sworn in as a Mortgage Custodian for the Kadaster on St. Maarten by his Excellency Governor Eugene Holiday on Tuesday morning. She has a wealth of experience about the inner workings of the Kadaster office where she worked for several years. Her addition to the Kadaster office according to Chef Du Cabinet for the Minister of Finance Wilgo Lieveld is to assist in clearing up some of the backlogs that remains at the Kadaster. The ceremony was held at the Governor’s Cabinet in the presence of Interim Director of the Kadaster Robert Boekhold, Lieveld, Mortgage Custodian Registry Chairman Louis Crastell Gumbs along with her husband, Sidney De Weever. In the photo from the left, Boekhold, Lieveld, Marie De Weever, Gumbs and Mr De Weever. The Honourable Minister of Finance Perry Geerlings has extended his congratulations to Mrs. De Weever on her appointment and says he looks forward to her continued excellent service to the people of St. Maarten.